Amazon kindle Fire What are the new Kindle fire HD features? The Kindle Fire HD is the latest tablet to be released by Amazon, the top online retailer in the world. The Kindle was one of the first readers to be released, and it has held its own against tablets like the iPad, the Nook, and others. The Kindle Fire HD is Amazon’s response to the iPad, and it provides users with the versatility and flexibility that they didn’t have with the original Kindle. For those who are looking for a more economical device that can do almost anything the iPad can do, the Kindle Fire HD may be a good option to consider. •Stellar Resolution – The screen of the Kindle Fire HD features a resolution of 1920 x 1200, true HD picture. This is even more amazing when you consider the fact that the tablet has a 8.9 inch screen, which means that the tiny screen has even better graphics than most larger tablets. •Amazon Access – The Amazon library is the largest library in the world, and you will find that just about anything that can be found online can be found in the Amazon database. While the original Kindle only gave you access to Amazon’s e-book and newspaper library, the Kindle Fire HD can also access games, movies, TV shows, magazines, songs, and more. •Quality Audio – The Kindle Fire HD uses Dolby audio to ensure that your tablet is a pleasure to listen to music or watch movies on, and you will find that the dual driver stereo speakers will produce clear sound that can even be digital surround sound. •Sleek Design – The Kindle Fire HD is a tablet that’s built for comfort, and you’ll find that it’s one of the sleekest and lightest tablets around. It’s a simple one to use for just about anyone, and you’ll find that it’s very comfortable to hold thanks to its light weight. •Versatile OS – The tablet features Google’s latest OS, Ice Cream Sandwich. The OS by Android is surprisingly versatile, and you will find that it will make personal entertainment a whole lot easier. You will be able to multi-task with the many apps, and you will find that there are few things the OS cannot do. •Storage Space – The Kindle Fire comes in 16 and 32 GB models, which will provide you excellent internal storage space. However, the device also allows you access to Amazon’s Cloud storage for free, and you can store as much of your Amazon content as you want without paying a cent. •Battery Life – While the Kindle Fire HD can’t match up to the original Kindle in terms of battery life, you will find that it will still beat the iPad and most other devices hands down. With the Kindle Fire HD, you get as much as 11 hours of battery life, making personal entertainment on the go much easier! 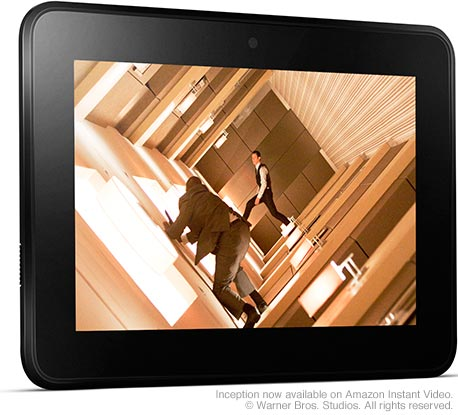 •Speedy Processor – The processor used in the Kindle Fire HD is a dual core CPU, and it runs at speeds of 1.2 GHz. The Imagination Power VR 3D graphics core will give you excellent graphics, and you will find that all of your games and movies will be a real pleasure. •Extras – The new Kindle comes with a front-facing camera, which will allow you to chat with others using Skype. It also has an HDMI connection, giving you the ability to connect your device to your Smart TV. The truth is that the Kindle Fire HD is one of the best new tablets on the market, and it’s one that you should consider if you want a great tablet without spending the small fortune an iPad will cost. This guest post is contributed by Daniel Petrovski, who loves to write and select the best of everything.